At JGS Overhead Door Systems, we are one of the leading dealers of overhead residential, commercial and industrial garage doors in the area. Our company is a detail-oriented one and we work exclusively with top manufacturers in the industry such as Garaga, our main garage door line. Why did we make this choice? Over the past years, we have noticed that home owners know more about garage doors and they all ask for the same thing, quality! By carrying Garaga, we provide our customers with top quality products that are stylish and energy-efficient. Now, take a look at our image gallery. With the wide range of models and colors we have available, you’re sure to find the one to give a distinctive look to your home. 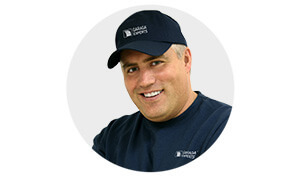 Our helpful team will guide you in making the right choice for your garage door needs. Would you like to receive a price for your project now? Then just complete our online quotation form. We hope to make your garage door experience a pleasurable one. Your garage door is the biggest moving part of your home. Just like your garage door, your door opener has to be built to last. At JGS Overhead Door Systems, our staff can recommend the appropriate garage door opener to fit your needs. Because we are dedicated to quality, we carry LiftMaster, the brand classified first in its category. Manufactured by the Chamberlain Group, the openers are built using robust components and powerful motors while always keeping your safety foremost in mind. The result is LiftMaster being the most reliable brand on the market. Discover our complete line in our opener section and learn more about their features. They can be installed for residential, commercial or industrial applications. If your garage door or your door opener needs to be fixed, don’t wait any longer. With fully-stocked trucks on the road, our expert technicians can easily get to your home or place of business and make the necessary repairs. We also service your system and make suggestions to improve its performance. To ensure long-lasting performance, one of our maintenance programs can be used to prevent future mishaps. In our store we also stock replacement parts like weather seal, trim, rollers, hinges and cables for the do-it-yourselfers. All items are available over the counter cash and carry. Call ahead so we can prepare what you need and have it ready when you arrive. We serve a large area that includes all of Rhode Island, Southeastern Massachusetts and nearby Connecticut. Get in touch now with one of our technicians by scheduling a service call online. We look forward to serving you soon! RI: Barrington, Burrillville, Coventry, Cranston, Cumberland, Glocester, Jamestown, Providence area, Smithfield area, Warwick, Woonsocket. MA: Attleboro, Auburn, Bellingham, Blackstone, Fall River, Milford, Millville, New Bedford. CT: Brooklin, Danielson, Killingly, Moosup, Putnam, Windham, Woodstock.